Voilà le système pour gérer les courses. Pas besoin de modifier la powerbase comme ce fut le cas pour PcLapCounter. En plus il fonctionne sous macOs, ce qui m'arrange très bien. Pour le moment en anglais, je ferais peut-être la traduction quand j'en aurais le temps. Mais si vous ne comprenez pas un bout de l'article je pourrais vous y répondre. 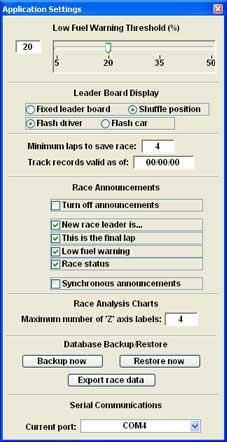 Race Monitor: All of the data displayed on the 2 1/2" x 1 3/8" LCD screen of the N-Digital console during and after a race are displayed by MAARDS on a computer screen. This includes the leader board (race position), lap count, elapsed time and fuel status for up to eight driver/car entries, constantly updated throughout the race. In addition to the visual display, optional audible announcements can be made whenever there is a lead change, status change or a driver is running low on fuel. Race History and Analysis: At the conclusion of the race the results can be sent from the N-Digital console to theMAARDS application. The results -- including final positions, laps completed, elapsed time and fastest lap -- are displayed on the computer screen and automatically stored in the Race History database. 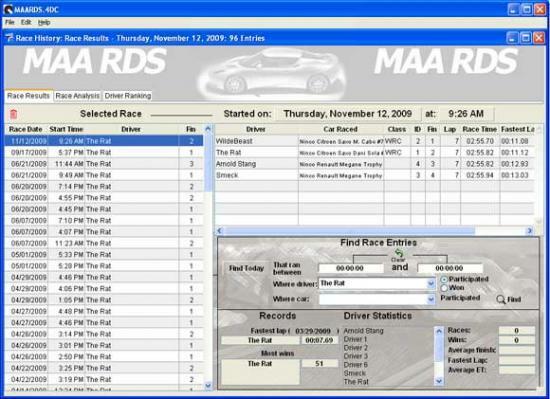 MAARDS uses a powerful relational database to store driver names, slot car descriptions and all individual race entry results. Data may be searched and analysed by virtually any criteria contained within the data itself, including: race date and time, drivers and cars participating, and statistics such as number of wins or fastest lap. The results of the searches can then be analysed and graphed based on driver/car or driver/class combinations. 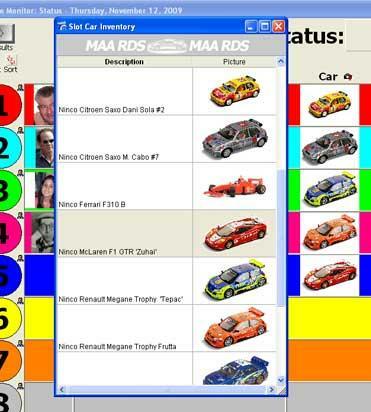 Once the database contains slot car descriptions and pictures, they can be entered in the car fields from a slot car inventory list that can be displayed at any time. 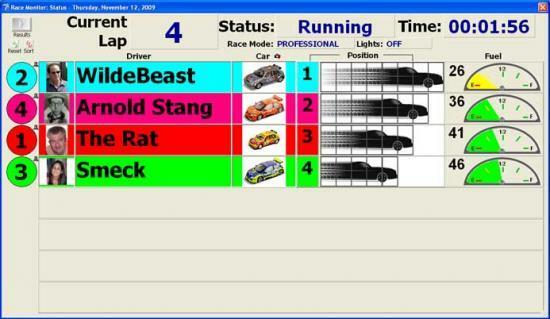 Select the car's row in the list then drag and drop it on any of the eight car description fields in the Race Monitor window. The description and picture (if available) will automatically be entered in the selected field. Application settings such as turning individual race announcements on and off, setting the threshold for low fuel warning, type of leader board display and others can be controlled by the user. 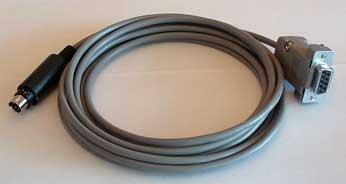 MAARDS is available as a complete plug and play solution with a high-quality ten foot serial communication cable. Just plug the MINI-DIN 6 end into the N-Digital console and the DB9 end into your computer’s serial port, start the MAARDS application and you’re ready to race. 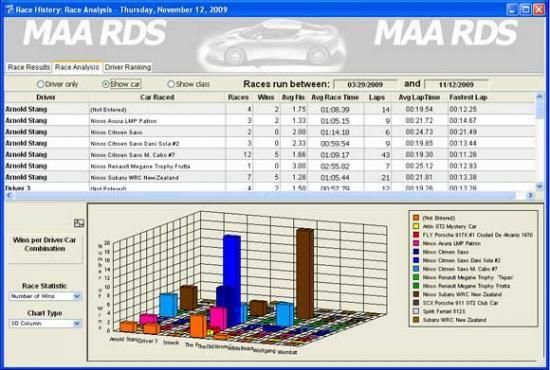 The race monitoring and analysis features of MAARDS are quite comprehensive. However, using the application to enhance the fun of digital slot racing can be remarkably simple, requiring virtually no user interaction beyond starting the race at the N-Digital console. 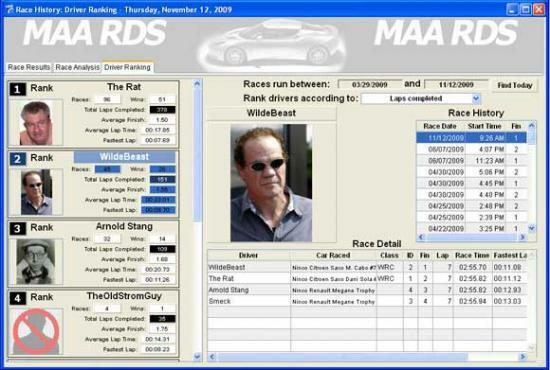 MAARDS was designed to add to the fun of digital slot car racing, not playing with a computer or tinkering with electronic hardware.